In part 1, we will learn how to strand beads together. I completed the Wire 1 class offered from Beadworld. 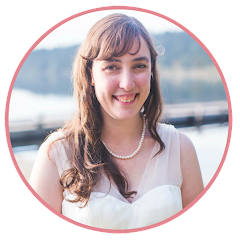 The instructor, Christina, has years of experience in the jewelry industry as well as training as a professional metal smith. She is an experienced teacher as well. As a daughter of a teacher who had thought about a career in teaching, I was pleasantly pleased with her teaching technique. At the end of her lesson, she tasked us with an assignment that builds on the smaller steps she taught. She stated that she was going to walk out of the room and expects us to teach each other if someone isn't sure what to do. She left the room so that she wouldn't interfere. She wanted the students to help each other succeed, because when you teach someone else to do something it really solidifies the task in your mind. During a break we were allowed to shop and all purchases was discounted 10% off. There was tools provided and all the materials necessary to follow along with lessons, make one class project and to practice. This class was a beginning wire class and covered tools, supplies and the basic loop. We made one pair of earrings from the skills we learned in the class. 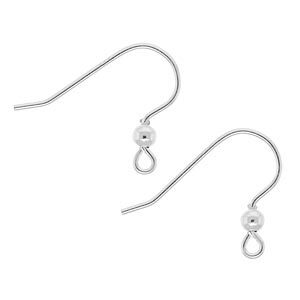 This article will cover what was covered in the class and then a follow-up article will cover the steps to create a pair of earrings. 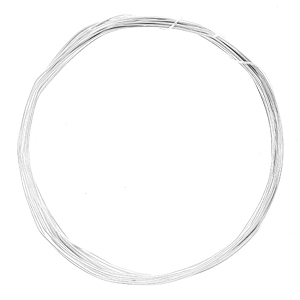 There are three tools that are required for wire working. This is what you will need to complete the basic loop and make your own pair of earrings! As metal is worked (including moving, bending, gliding your fingers across it and hammering) the molecules rearrange themselves to become tighter, which makes the metal harder. It is a linear progression and what we do with wire shaping tends to move from right to left on the below chart. Heating the metal can bring the metal back to the right. 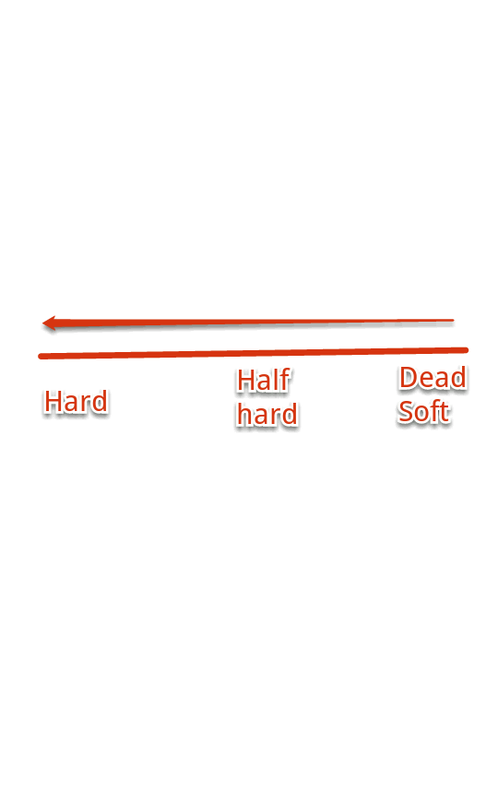 Metal wire can be purchased in either the "Dead Soft" or "Half Hard" stages. 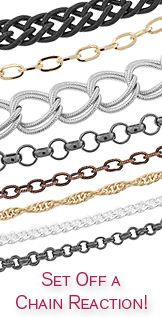 The choice of wire is dependent on how much work the metal is going to experience before being the final product. As the metal is being worked, it moves from soft to hard. Hard is where we want the final piece. If the metal goes beyond that point, it becomes brittle and breaks. Never unbend and reshape metal wire. If you make a mistake, it is best to just start over. to be hard, but to not go beyond hard where the metal becomes brittle and will break. 3" of wire - as you get better at making these, you will use less wire and conserve materials. While learning, go ahead and be generous with your wire lengths so that you have plenty of room to work. 1 headpin - buy the 3" long headpins to start wit, but you will eventually be good enough to just use 2" long headpins. 2 round beads - buy ones that are center drilled (from top to bottom). Start off with round beads. Pearls may have too small of a hole for the 22 Gauge wire. Here are the steps for the basic loop. Apologies for the not super great pictures. This is my first tutorial. Click on the picture for an enlargement. Step 1: Using your chain-nose pliers, bend your wire 90 degrees roughly an inch from one end. From here on, the short end will be called the tail, while the long end will be called the stem. You can picture the stem being the stem of a flower, while the tail looks like a hunting dogs tail when he is pointing. Step 2: Grip the tail end with your round-nose pliers such that the tail is pointing away from you and the pliers are snug up to the bend. Step 3: Bend the tail end of the wire over and around the top of the pliers in a full circle in the opposite direction of how you bent it in step 1. Step 4: Rotate the loop with your round nose pliers still encircled such that the loop is centered on the stem, forming an O instead of a P.
Step 5: Remove your round-nose pliers from the loop. Step 6: With your side-cutters, cut the excess wire tail from the loop. Make sure your side cutters are lined up so the flat edge is flush with the beginning of the loop where the tail crosses over the stem. 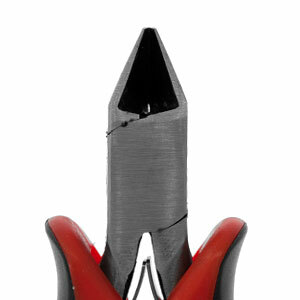 Step 7: With your chain-nose pliers, wiggle the end of the loop to be flush with the stem. Wallah! You have made your first eye pin! String the bead onto the eye pin and bend the stem over the bead, creating a new tail. Now thread a bead through your pin and repeat steps 1-7 on the other side. Instead of using pliers for step one, you may be able to just bend the wire over the top of the bead to ensure a flush start. Most likely you won't want to bend it a full 90; perhaps just 30-45 degrees. 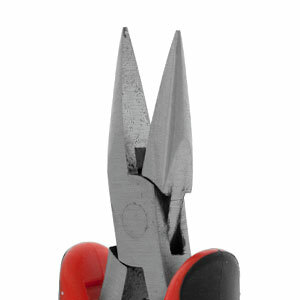 This will help you get your round nose pliers under the tail. You will want your round nose pliers to be as close to the bend between tail and stem, but it should still be on the tail end. You do not want to grip the stem. Now you have a double beaded eye pin! Now let's do it with a head pin. Thread your head pin through your bead. Make sure to check that the head pin doesn't slip into the bead's hole. If the hole is too big, then try using a small spacer bead. Now repeat steps 1-5 above, potentially substituting using your chain-nose pliers by just bending the wire over the top of the bead in step one. The headpins are generally stiffer and harder to work with than the German jewelry wire, so you may need to use the chain nose pliers. Stop after Step 5. This is your first beaded head pin. Before cutting the excess tail, thread the tail end through the eye of your double beaded eye pin. You will hear a small "tink" sound when the eyes are connected. Thread the loops together until you hear a small "tink." Now continue with steps 6 and 7 above. Your first strand of beads. Wallah! Your first strand of beads. Go to my Google+ album for more pictures! We'll go over making your first pair of earrings in Part 2. 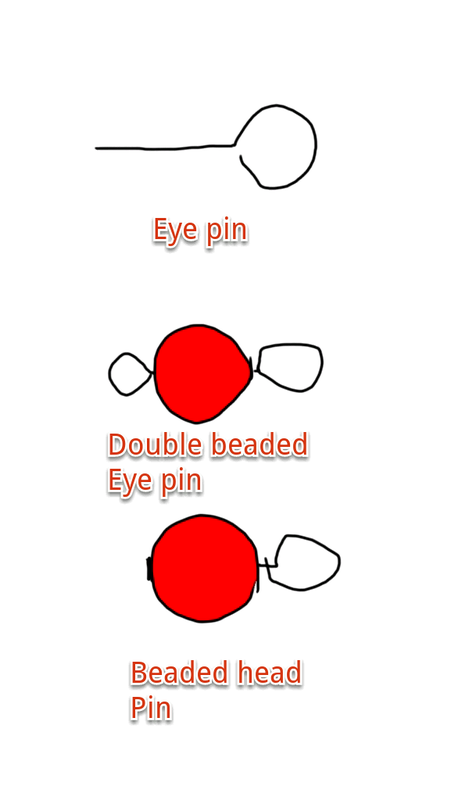 Shown top to bottom: eye pin, double beaded eye pin, beaded head pin. How to open/close a loop. This is key to preventing losing the shape of the loop and causing metal fatigue. 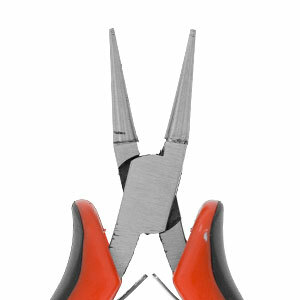 When you open your loop, take the chain-nose pliers on the end of the loop and twist the loop open to the side. Close the loop by twisting it back into place. Never open the loop like a jaw - this will ruin the shape and you will never be able to restore it. See Fusion Beads tutorial on opening and closing a loop for more details. Remember to take breaks! Don't work on a project too long. Symptoms of eye fatigue might be a headache, frustration, decrease in dexterity (hand eye coordination), etc. You may not even realize you have it, but if you find yourself feeling frustrated or making mistakes, take a break. Even five minutes can save your eyes! going to show you how to make these. Pinterest - Check out all the inspirational projects that are posted to pinterest. Check out Wire 1, Part 2 for a tutorial to make my first pair of earrings! Have you taken any jewelry making classes? If so, please share the location and name of where you took the class and a general review of your experience and whether you would recommend them in the comments below. This is really great basic info., thanks!